The view depicted is of the now-destroyed Heiligewegspoort on the southern edge of the old city wall at the end of the Heilige Weg (so-named because it was ultimately the route for the Holy Land), on the site today of the corner of the Leidsergracht and the Herengracht. The gate was built in 1636, as a replacement for an older gate of the same name, by Jacob van Campen (1595-1657), the great exponent of Dutch Classical architecture also responsible for the Amsterdam Town Hall. The majority of depictions of the gate are from the outside of the city, including four by Jan van Kessel, one of which is now in the Rijksmuseum, Amsterdam (inv. no. A2506). The only known views from the interior are a drawing from the north-west by Jan Abrahamsz. Beerstraten of 1662 in the Chr. P. van Eeghen Collection at the Amsterdam Municipal Archives (inv. no. v.E. 17), and a painted depiction from a similar viewpoint to the drawing, attributed to Abraham Beerstraten, also signed 'A. Beerstraten' (RKD files). The present, previously unpublished work, is a third example. It is also of particular interest showing as it does the newly completed buildings on the Herengracht, built by Philips Vingboons between 1660 and 1662, including the two belonging to the Amsterdam merchant Jacob Cromhout and now the site of the Bijbelsmuseum. Their depiction allows an accurate dating of the present picture to 1662-4. The admiration Beerstraten's contemporaries felt for Van Campen's design is expressed by their detailed accounts of the gate: Melchior Fokkens (Beschrijvinge der wijdt-vermaarde koopstadt Amsterdam, Amsterdam, 1662), Olfert Dapper (Historische beschrijving der Stadt Amsterdam, Amsterdam, 1663) and Philipp von Zesen (Beschreibung der Stadt Amsterdam, Amsterdam, 1664) all extolled its beautiful white stone construction and the brightly painted sculptural decoration of heraldic figures set in niches adorned with implements of war. In addition, Tobias van Domselaer (Beschryvinge van Amsterdam, Amsterdam, 1665) wrote of its blue slate roof with two chimneys sculpted to look like great flowerpots and the frieze decorated with Amsterdam's coat-of-arms. He also described its largely symbolic function as a watchhouse, with a guardroom provided to each side of the entrance, one for the citizen guards and the other for professional soldiers. Finally, he mentioned the vaulted stone bridge (seen here) added to the east side of the gate over the small canal running along the Heiligewegsburgwal connecting the Singel to the city canal. As it was, however, the rapid expansion of the city meant that the gate soon found itself within the new city boundaries, its purpose supplanted by the Leidsepoort on the new city wall. On 9 July 1664, the city fathers ordered its demolition, requesting that, where possible, its fragments be put to good use elsewhere. On 4 September they gave a more specific directive to this regard, stipulating that the ashlar be used to make the portcullises of the Muider- and Weesperpoorts. Work proceeded quickly: the treasurers' proposals to the burgomasters for the fiscal year 1665, submitted on 31 January, included the joining of the new Herengracht to the old and the removal of the sluice on the Wetering next to the Heiligewegspoort. The filling of the canal next to the gate was finished by 11 February 1665, creating the Konigsplein. The Beerstraten were a Dutch family of artists, including most prominently Jan Abrahamsz. (1622-1666) and his eldest son, Abraham. Both Jan and Abraham specialized in paintings of winter townscapes, sea battles and southern sea ports. Paintings signed 'J...', 'I...', or 'Johannes Beerstraten' are assumed to be by Jan; to date, however, it is unclear who made the paintings signed 'A. Beerstraten', which differ considerably in quality. Besides Abraham, a certain Anthonie Beerstraten is said to have been active as a painter of winter landscapes and sea battles in Amsterdam from 1635-65; his relationship to Jan Beerstraten is not known and it is possible that he did not in actual fact exist. 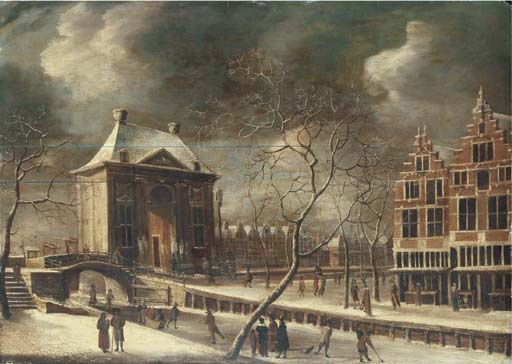 Either way, the better paintings from that latter group are attributed to Abraham on the basis of comparison with the View of the Old Town Hall in Kampen of 1665 (formerly Lansdowne Col., Bowood House, Wiltshire), that is signed 'Abraham Beerstraten': this group includes the view of the Heiligewegspoort mentioned above and a winter view of the Noorder Kerk in Amsterdam (Amsterdam, Historisches Museum), also signed 'A. Beerstraten', on the basis of which the present painting is also given to Abraham.